Enjoy a fun evening with friends at SAAC and learn more about all things Summer. Register for Summer Camps! Get an audition packet for “The Wizard of OZ.” Meet the staff! Ask questions! Open to children 7-16 who are not auditioning for a principal character. Everyone will be taught a dance movement, play theatre improv games and learn a song from the show, “The Merry Old Land of Oz.” Anyone under the age of 18, must have a parent or guardian also sign the audition form. Open to adults and children 13up auditioning for all roles except Munchkins. Everyone will learn a simple dance combination, read from the script, and sing a song (unless auditioning for a non-singing role). Please be prepared to sing one verse and a chorus from a song of your choice. Select something that is comfortable within your vocal range and bring the accompaniment sheet music. 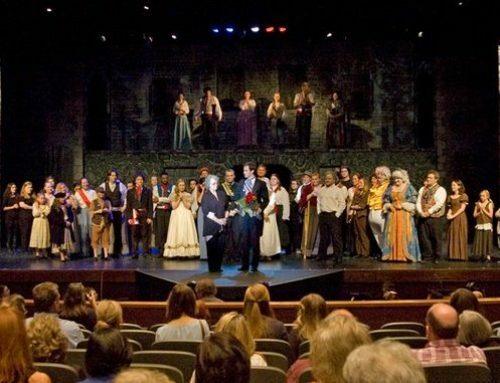 A musical theatre piece not from this show is preferred but you may choose to sing something familiar to you, such as a classic music standard. If you are called back for a specific part, you will be asked to sing a song from the show. For more information call the SAAC office at 862-5474. FUN and Open Show that Needs All Physical Types! Darrin has worked in community, regional, and professional theatre in the United States and the United Kingdom for over 30 years. He has also worked within film, fashion, and television in San Diego and Los Angeles, California. Darrin has designed for the National Academy of Television Arts and Sciences’ Emmy and Academy Awards. At SAAC, he has directed Agatha Christie’s The Mousetrap, Agnes of God, Cabaret, Chicago, Rodgers and Hammerstein’s Cinderella, and Willy Wonka. He is currently the Drama Instructor and an Artist in Education for SAAC. Like so many girls her age, little Dorothy Gale of Kansas dreams of what lies over the rainbow. One day a twister hits her farm and carries her away over the rainbow to another world. Come join Dorothy, the Scarecrow, the Tinman, the Cowardly Lion and Toto as they travel the universe of Dorothy’s imagination. Of the two version available, SAAC is producing the one that is the more technically complex production and uses as much of the aura of the film as is possible to create in a modern theatre. It is an adaption for live stage performance, even while it strives to look and sound just like the famous film, in telling the story. Originally presented by the Royal Shakespeare Company at the Barbican Centre in London in 1987, there is more work for the chorus singers and small vocal ensembles in the music material for this version. Dorothy Gale, a young girl who lives on a farm in Kansas with her Aunt Em and Uncle Henry, gets in the way while the adults try to work. She finds a quiet place where she won’t get into any trouble -Over The Rainbow. The girl is upset because their mean neighbor, Miss Gulch, presents her with a Sheriff’s summons for her cherished dog, Toto. Toto escapes from Miss Gultch’s bicycle basket and joins Dorothy as she runs away from the farm. They meet up with kind Professor Marvel, who convinces her to go back home. A cyclone hits the area, and Dorothy and Toto are locked out of the family’s storm cellar. They go into her room in the house, where Dorothy is accidently hit on the head. This begins their journey to the Land of Oz. When she wakes up in Oz, Dorothy is greeted by Glinda, the Witch of the North (who has an uncanny resemblance to Aunt Em.) Upon landing, Dorothy’s house inadvertently lands on and fatally strikes the Wicked Witch of the East. This frees the Munchkins from the Wicked Witch of the East’s power, so they now consider Dorothy their heroine -Ding Dong! The Witch Is Dead & Munchkin Musical Sequence. The Wicked Witch of the West (Miss Gulch) comes to avenge her sister’s death and to claim her sister’s magic ruby slippers, only to find that Glinda has already put them on Dorothy’s feet. The Wicked Witch of the West has a new challenge – to get those slippers for herself. Dorothy wants to go back home to Kansas, but the Munchkins tell her the only one who may help her get back home is the Wizard of Oz. So Dorothy is off to see the Wizard -Yellow Brick Road. Along the way she meets three new friends and travel companions. The Scarecrow (Hunk, the first of Uncle Henry’s farmhands) explains why he needs to see the Wizard in If I Only Had A Brain. The Tinman (Hickory) joins them because his life would be better If I Only Had A Heart and the Lion (Zeke) comes along -If I Only Had The Nerve. All four sing We’re Off To See The Wizard. The Wicked Witch of the West makes her second unsuccessful attempt to get Dorothy’s ruby slippers when Dorothy is with the Scarecrow and the Tinman. But she fails to scare them. Her next plan includes the Lion, and involves a beautiful field of poppies with a poisonous scent. Glinda rescues the travelers by turning the poppies into snowflakes -Poppies. Our travelers arrive at the Emerald City to be discouraged from entering by the Gatekeeper (Uncle Henry). He finally lets them in -Merry Old Land Of Oz. Before they are allowed to meet the Wizard, the travelers must be cleaned up by the Osians. Even after they prepare for the meeting, the Wizard refuses to meet them. The Wicked Witch appears again. The lion fantasizes in King Of The Forest. The guard finally brings them to the Wizard, but the four friends must prove themselves worthy of the Wizard’s help by bringing him the Wicked Witch of the West’s broomstick. The only way to get her broomstick would be to kill her. So off the foursome goes, to the land of the Winkies (the Wicked Witch’s slaves) and the Wicked Witch’s castle. The group is in the haunted forest filled with jitterbugs that spook them. The jitterbugs make them dance until they all collapse from exhaustion – Jitterbug and then the Wicked Witch’s flying monkeys swoop down and capture Dorothy and Toto. At the castle the Wicked Witch again fails to take the ruby slippers off Dorothy’s feet, so threatens Dorothy with her life. Toto manages to escape. The Lion, Scarecrow and Tinman recover from the poppies’ scent, and make it to the castle to rescue Dorothy. Toto meets them at the entrance, and they sneak in, wearing Winkie uniforms, as part of the Winkie army. The foursome and Toto are reunited, but the Wicked Witch prevents their escape. The Wicked Witch becomes even meaner and threatens the Scarecrow with fire on her broomstick. Dorothy throws a bucket of water at the fire and ends up dousing the Wicked Witch. The Wicked Witch screams, smoulders and shrinks. She melts into nothing. -Ding Dong The Witch Is Dead (reprise). The foursome take the broom back to the Wizard. Back in Kansas the storm is over. Dorothy wakes up confused, with a bump on her head. She and Toto were not the only ones who had an adventure during the storm. Miss Gulch was hit by a telegraph pole and broke her leg. At least Miss Gulch won’t be bothering Toto for a while. Dorothy appreciates her family and friends even more than ever. Just for fun, here is an interesting video from the computer artist that remastered the original 1939 movie with 3D graphics. Enjoy! !